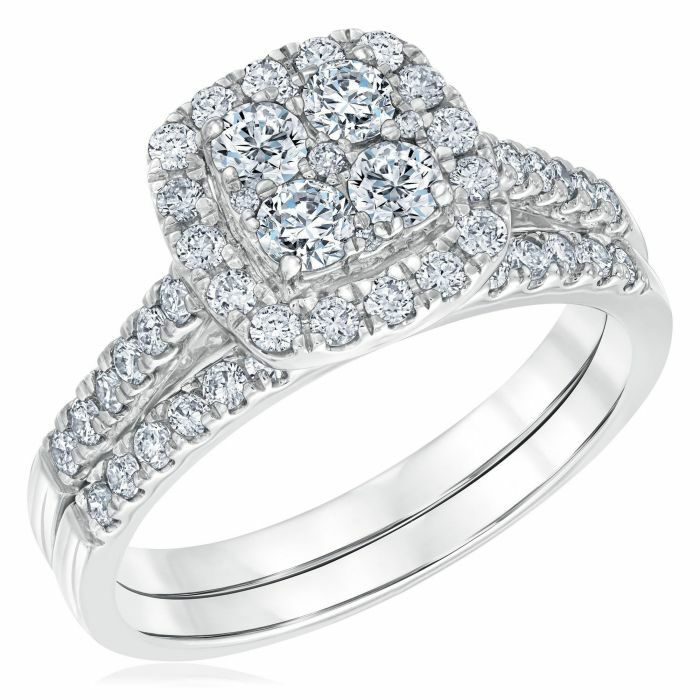 Celebrate your love and commitment to her with this gorgeous 14k white gold diamond engagement and wedding ring bridal set from the Ellaura Harmony Collection. Radiating timeless elegance, this ring features a cluster of sparkling round cut diamonds set in a cushion shaped frame that is bordered by round cut diamonds. Completing this classic look are round cut diamonds decorating the shoulders of the engagement ring and the matching wedding band. Diamonds are 1ctw, I or better for color, and I1 or better in clarity. This ring measures 10mm at the top and 2mm at the bottom, and the matching band measures 2mm at the top and 2mm at the bottom.